Cinematic portrait of a desolate mining town, the smallest in Colorado, USA. A microcosm of the world, the residents claim. 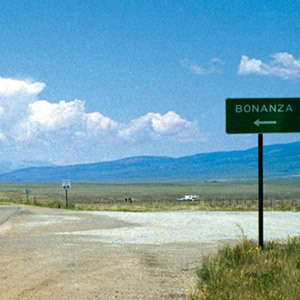 In Bonanza there were once 6000 inhabitants catered for by 36 saloons, seven dance halls and an immense number of prostitutes for the miners. Their motto was: get in, get rich, get out. Now there are only seven residents, immersed in their own spirituality, living on a hotbed of accusations. Berlin portrays this world in miniature on a scale model of the town and five film screens. Soundtrack by Peter Van Laerhoven. Part of Big in Belgium season. "Armed with cameras, interview techniques, editing tables and actors, Berlin portrays reality like a painter used to do: with a bit more color, lively angles of incidence and a brush setting that betrays a critical undertone. "